After basking in the golden sunlight and turquoise waters of Shoal Bay beach, rejuvenation and relaxation awaits you. 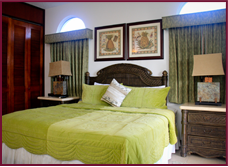 Our lovely one-bedroom suite is perfect for a couple's getaway. 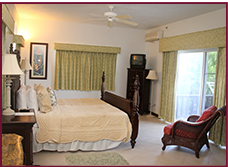 The bedroom has a comfy king bed with luxury linens...very private and lovely balcony with panoramic views of the ocean and our beautiful lush gardens. 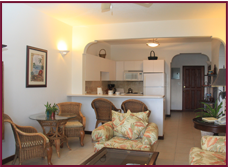 Enjoy the balmy ocean breeze from the comfort of your private balconies of the 2 bedroom suites. This suite encompasses 2 private bedrooms consisting of king beds, living and dining area and fully equipped kitchen, great for families. Designed with your comfort in mind, equipped with coffee maker and mini refrigerator, iron and board, hair dryer and in-room safe, the studio provides affordable luxury for two. Listen to the waves as they gently whisper soothing sounds on cool nights while enjoying the views from your private balcony ensuring that you will never miss a sunrise. We also arrange the following services at no additional cost. You simply pay each vendor directly.